It was a sunny and calm day and not surprisingly our destination was completely crowded with fishermen and women wishing to try their luck. There did not seem to be much around apart from some small fish splashing around on the surface. My brother tried a small chrome lure and after a few casts was surprised to be hit by a near legal tailor. I tried to change over to plastics, a 2 inch sandworm, and I was able to hook up small tailor on every cast. One hook up seemed slightly heavier, and after a short fight, up came a bream. It was only a tiddler, but after hearing how hard it is to catch bream on plastics, I thought it was worth putting it up. There was not much else on offer for the rest of the day. 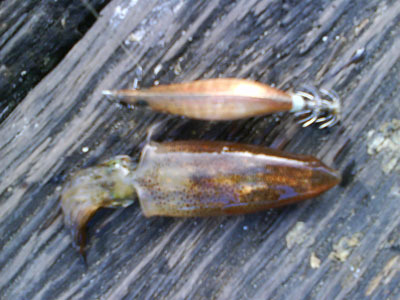 We were able to catch a squid at the end of the day, again another tiddler, barely the size of the squid jig itself! 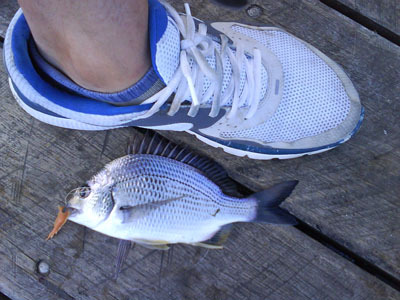 We tried to put it out live, but was smashed by snapper.